If you successfully upgraded your Blu-ray player using the "Network upgrade" you don't need to apply this procedure. If this is not your BD player model please click here to select the correct model. This utility is only for use with the Blu-ray players sold within Europe. Not all models are sold in all countries. Please follow the upgrade instructions carefully. Failure to follow the instructions may interrupt the upgrade process and may cause the player to be unresponsive or to require repair. Do not power off the player or disconnect it from the AC power outlet. Loss of power during the installation of the firmware upgrade may cause the player to be unresponsive or to require repair. Your Blu-ray player will be reset to the factory default settings. After installing the upgrade you will need to reconfigure your player. Use a brand new recordable CD-R disc to burn the firmware upgrade. The player may not be able to correctly read a dirty disc or a disc with scratches. Mac OS X 10.6.3 is recommended. You need a computer with a CD writer. Power on the television and make sure it is tuned to the inputs to which the Blu-ray player is connected. Power on the Blu-ray Disc™ player. If the player starts to play a disc, press the "STOP" button and wait until the blue Sony Blu-ray Disc™ screen is displayed on the television before proceeding. At the "xross media bar™" (XMB™), use the arrow keys on the remote control to highlight "Setup" > "System Settings" and then press the ENTER button. Use the arrow keys on the remote control to highlight "System Information" and then press the ENTER button. If the version number is 024 or higher, it is not necessary to install this firmware upgrade. Download the UPDATA_07x024M.ZIP file to a temporary or download directory (please note this directory for reference), and extract the Zip file. Go to the directory where the file was downloaded and verify that the size of the UPDATA_07x024M.ZIP is 49.6MB (52,019,653 bytes). In the UPDATA_07x024.ISO information screen verify that the size listed is "49.6 MB (52,060,160 bytes)". 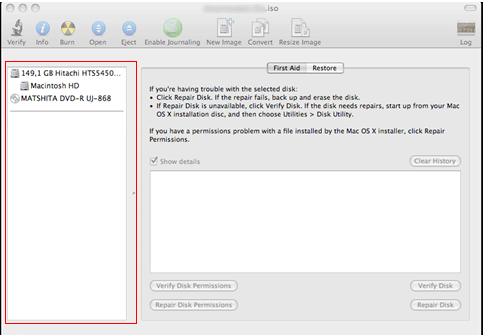 Drag and drop UPDATA_07x024.ISO file from the location where the file was downloaded (temporary or download directory) to the left pane of the Disk Utility window. Insert an empty CD-R in the computer into the computer. Select UPDATA_07x024.ISO and click the [BURN] icon. In the appearing window click the option [BURN]. Note: You can select also choose to Verify the burned data by the clicking the disclosure triangle and selecting the [verify Burned data] checkbox in the window that appears. The process starts, and the file will be written into the CD. When the message "burned successfully" is displayed, [Click OK] and the disc will be ejected. Make sure the disc creation was correctly done without any error. In case of doubt, recreate a new upgrade disc. Do not create the upgrade disc using another process than the one described above. - Do not turn off the player or disconnect the player from the power supply during the upgrade process. Doing so may damage your player and make it unusable, and would require a repair of the player. - Do not press any button, except as instructed, until the upgrade is complete. Doing so may damage your player and make it unusable, and would require a repair of the player. A series of different messages will appear on the front panel display. Do not operate or power off the player until this message is displayed. Doing so may result in your player being unresponsive and requiring repair. Power on the BD player and perform EASY SETUP according to the indication that will appear on the screen. Check the firmware version. If the version number is 024, the firmware upgrade was successful. Turn off the player, and disconnect the AC power cord. Reconnect the AC power cord while pressing down "Open/Close" button on the player. Keep pressing down "Open/Close" button on the player until the tray opens. Please note that pressing the "Open/Close" button on the remote control does not work. It is necessary to press the "Open/Close" button on the Blu-ray player. Push and hold the "POWER" button for several seconds until the unit power is off. Push the "POWER" button again to continue the firmware upgrade procedure. If the symptom does not improve after re-upgrade, remove the upgrade disc from the player and delete the upgrade files from your computer. Download the upgrade again and follow the entire procedure above to create a new upgrade disc and install the firmware upgrade. If the problem continues, please contact Sony. Remove the upgrade disc from the player and delete the upgrade files from your computer. Download the upgrade again and follow the entire procedure above to create a new upgrade disc and install the firmware upgrade. POWER was shut down while updating. Power on the player again keeping the upgrade disc in the tray. The upgrade should restart automatically. The UPDATA_07X024M.ZIP upgrade file I downloaded from the upgrade web site cannot be extracted. The download may have failed. Delete the downloaded file and download the upgrade file again. The firmware upgrade does not finish, after running for more than 30 minutes.